The holiday resort and fishing port of Lakes Entrance is situated on the eastern end of the Gippsland Lakes, just east of the artificial entrance of the lakes to the sea. The town, 330 km east of Melbourne, lies on a narrow neck of land between Cunninghame Arm, formerly Reeves River, and North Arm. The shores of the Gippsland Lakes were inhabited by the Tatungalung tribe, evidenced by middens which exist in bluffs east of the town. The Aborigines were hostile to the first pastoralists who arrived in the area in the late 1840s. The first homestead was near the natural entrance, which was east of the present town, in the vicinity of Lake Bunga. In the late 1850s John Campbell, an inland pastoralists, camped here with his family during the summer. Soon a few holiday houses were constructed and the locality became known as Campbell Town. The entrance was first negotiated by a ship in 1858 and soon vessels were regularly entering the lakes. 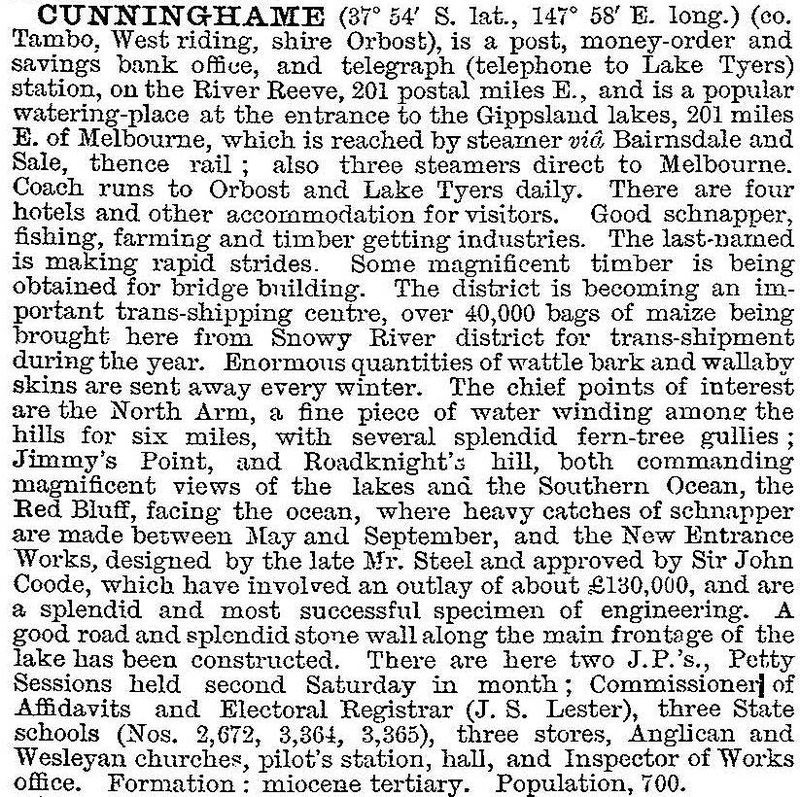 A township, known as Cunninghame after a pioneer Gippsland squatter, was surveyed near Lake Bunga in 1866. The natural entrance to the lakes was unreliable and often dangerous. After much agitation, work began in 1872 to cut an artificial entrance, west of the natural entrance. Some houses were built in the hummocks near the artificial entrance, named New Entrance and a settlement developed opposite, on the northern shore of Reeves River. Here township allotments were laid out and a busy port developed, stimulated by the entrance works, the growing steamer traffic on the lakes and the cutting of a new direct road to Bairnsdale to the west. Timber and produce from the hinterland were shipped and professional fishers used the port. Work on the new entrance proceeded slowly and in 1876 was abandoned. Sir John Coode, renowned harbour engineer, advised on improvements but work did not resume until the early 1880s. In 1889, the new entrance was prematurely opened when a severe storm broke through the remaining sand hills. The natural entrance quickly silted up. Cunninghame grew steadily in the new century, with many guesthouses and boarding houses catering to the tourist trade. A stone wall was constructed along the foreshore and the esplanade beautified with seats, lawns and trees. The town’s name was officially changed to Lakes Entrance in 1915. Camping became popular and to discourage camping on public land the first of many camping parks was established in 1928. A life saving club was formed in 1931 and in 1937 a footbridge was constructed across Cunninghame Arm, giving access to the ocean beach. Tourism slumped during the 1940s. With its revival from 1950 the guesthouses waned because steamers had disappeared from the lakes and visitors now arrived by motor transport. Motels and caravan and camping parks proliferated. Launches and cruise boats plied the lakes and more jetties were built to accommodate private craft. Numbers of holiday homes were constructed, increasing in the 1970s with the subdivision of land directly north of the township. Lakes Entrance also became very popular as a place of retirement. During holiday periods, as many as 45,000 people flock to the resort. Tourist accommodation is provided by two hotels, nearly 20 motels, about 30 camping and caravan parks and numerous holiday flats. As well, a large number of restaurants, other businesses and services cater to tourists. Lakes Entrance was the largest town in Tambo shire for many years and in the late 1980s became the administrative centre until council amalgamations in 1994. An office of the Department of Natural Resources and Environment supported the extensive sawmilling industry around Lakes Entrance. Lakes Entrance has Victoria’s largest fishing fleet, around 50 boats. The catch in 2007-08 was 4 million tonnes of fish. In the 1930s, declining catches in the lakes reduced the fishing industry but by the 1940s trawlers began to fish for shark in Bass Strait. Scallop fishing commenced around 1970, but by the late 1980s was greatly curtailed by fishing limits. The Fishermen’s Cooperative, which organises its marketing and supplies, sells fresh fish from their wharf where the unloading of boats can be viewed. Navigating the entrance is still somewhat unpredictable, a channel being regularly dredged through the sandbar outside. During the 1920s and 1930s, a number of bores were sunk around Lakes Entrance. Some oil was found, as well as artesian water which was utilised by the town. Further drilling in the 1940s and 1950s produced some oil. However, offshore drilling in the 1960s was highly successful and the wells were not further developed. Following years of promise and debate, it was announced in 2014 that Lakes Entrance would be connected to natural gas via a storage unit. Lakes Entrance’s attraction for visitors and residents is its scenic location and the easy proximity of recreational fishing, boating and swimming. It is a lively bustling resort, attractive to all ages, with a carnival each night during the holiday season. In the vicinity, there are a shell museum, an antique car museum, an Aboriginal art museum, a winery and an amusement park. There is a walking track along the sand dunes to the entrance, and tours through the forests near the town. There is a surf life saving club on the ocean beach. Despite oil spills at the Esso offshore platform, Lakes Entrance was identifed as a site for the future development of ecotourism and heritage tourism in 2013. In 2014 the Lakes Entrance primary school had 193 pupils and the secondary college 242 pupils.